The market leader in grid-scale energy storage speaks on SCE’s willingness to deploy the disruptive technology. Although 50 megawatts is a small fraction of the 1,400 to 1,800 megawatts of generation that SCE will procure between now and 2021, it's one of the earliest attempts to craft an RFO aimed at large-scale energy storage. 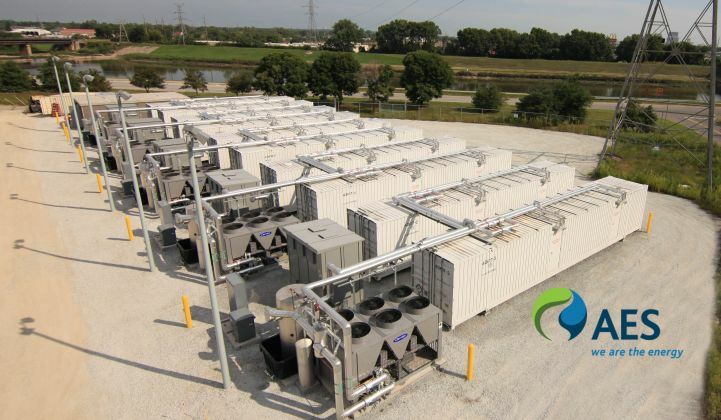 Regarding the Edison RFO, Chris Shelton, President of AES Energy Storage, told GTM in an earlier interview, "This would be a capacity-type contract process -- and we're very familiar with that process." Andres Gluski, CEO of AES, said the firm is "interested in markets where we operate." AES operates three thermal gas plants in California and generates about 25 percent of the generating capacity for the Los Angeles Basin. John Zahurancik, VP of Deployment and Operations at AES Energy Storage, told GTM, "The Edison RFO is the first formal recognition by a state that [energy storage] absolutely has value." He spoke of "leveraging the combination of energy storage and efficient natural gas plants." AES is the developer and operator of the largest commercially operating grid-scale energy storage project in the U.S.: the 32-megawatt battery storage project co-located with the 98-megawatt Laurel Mountain Wind Farm. The wind farm is run by AES Wind Generation. So AES, the power giant and parent company, is a built-in customer that knows how to maximize value in its generation assets with energy storage. As for technology, like all AES Energy Storage executives I've interviewed, John Zahurancik repeated a variation of the AES mantra: "We like sealed batteries -- we're agnostic within that technology." He said, "We are agnostic but opinionated." AES has been working with lithium-ion energy storage for five years, and any new battery entrant has to prove not only its technology, but also its "track record and balance sheet." Zahurancik saw the RFO as a "way to get started" in enhancing "local capacity and local reliability." Praveen Kathpal, AES Energy Storage's VP of market and regulatory affairs, said that the RFO is oriented toward local capacity requirements in the LA Basin -- a capacity alternative offering "where energy storage can perform the same functions as building a new peaking power plant." He noted that the storage facility could provide ancillary services as well. Zahurancik observed that California and SCE have structured the offer so that storage can be treated similarly to a preferred resource like demand response or energy efficiency. Storage, in this RFO, will be paid for by power purchase agreement -- the same cost recovery mechanism used for a gas-fired plant or solar or wind plant. Praveen Kathpal noted that the PPA mechanism can attract new technology without placing that burden on the ratepayer -- making sure the technical risk is supported by the contract and bidder. Kathpal said, "It allows companies to bring new technology to market." Zahurancik noted the four-hour requirement and suggested that figure has been common to other offers, although some have called for six hours of storage capacity. He cited a PG&E presentation that identified sweet spots at 30 minutes, two hours, and four hours -- with distinct applications for each time capacity. AES Energy Storage has installed more than 100 megawatts of energy storage in the U.S.
Zahurancik said, "It's very interesting to be working in California -- watching how storage is being [viewed] by system operators and how it lines up with broad policy objectives." He said that he expected energy storage to follow the trajectory of demand-side resources, which were once a mystery and are "now a great asset." AES and system integrators such as S&C, GE, ABB or Xtreme Power are the best-scaled and best-suited companies to respond to this type of energy storage solicitation. Behind the system vendors are battery giants such as LG Chem, Panasonic, and Saft. A number of startups such as Ambri, Aquion, and Eos have new battery chemistries and are targeting low-cost, utility-scale energy storage as well. A123 is still in the lithium-ion battery business. Calmac and Ice Energy are ice-energy air-conditioning storage players with significant operations in California. Isentropic Energy is a U.K.-based thermal energy storage startup. There are variations on compressed air energy storage (CAES) from LightSail, SustainX, and General Compression. Mechanical approaches such as those of Gravity Power, GBES, or Energy Cache, are another technological option. Flywheels from Beacon Power are effective for fast storage, but not for the capacity requirements of this RFO. Molten salt used in tandem with concentrating solar power (CSP) could also be a possibility. As we've reported, California is home to several large-scale energy storage projects funded by DOE smart grid stimulus grants. PG&E is building a 300-megawatt, ten-hour CAES system in the Central Valley, and Southern California Edison has been working with LG Chem on an 8-megawatt, 32-megawatt-hour lithium-ion battery warehouse in the Tehachapi mountain range. Both are aimed at stabilizing and integrating the state’s wind power resources into the grid. Energy storage allows the utility to meet looming regulatory requirements for its fossil fuel plants and also creates an enormous business and innovation opportunity. The SCE RFO will jump-start the energy storage market, forcing the utility to assess the value of storage and the energy storage supplier to truly meet the needs of the utility. GTM Research’s recent report, Grid-Scale Energy Storage in North America 2013: Applications, Technologies and Suppliers, makes it clear that most grid-scale storage applications “lack the right mix of regulatory support, costs, revenues and other attributes to be economically viable,” but that certain combinations of services can make projects viable today -- and customer-sited storage can meet the largest share of those services.